When Schneider Electric merged APC and MGE UPS a few years back, it allowed us to offer unique UPS modernization services to manage the full life cycle of customers’ data center energy needs. For data center professionals evaluating modernization services, knowing what questions to ask isn’t always straightforward. Based on years of working with clients, below are answers to the top five questions you should ask when considering UPS modernization. 1. What if I don’t want to disrupt my current environment to refresh my UPS system(s)? Good news: You may not have to. This may mean upgrading critical components, or upgrading your full solution. Our modernization experts can plan your full project to minimize disruption and downtime, while our modular solutions enable you to revitalize or modernize key components without replacing the entire infrastructure. This helps save time, money, and inconvenience. 2. What experiences can you share related to helping customers like me modernize their data center? We have helped many customers with small and large data centers to modernize their solutions in a variety of ways. In some instances the customer is looking for a full replacement solution, and in other instances the customer is looking to improve efficiency with minimal impact on a budget. Whichever end of the spectrum you fit into, our modernization experts can work with you to recommend the best solutions. 3. I hear a lot about efficiency benefits if I upgrade. What is the real benefit? 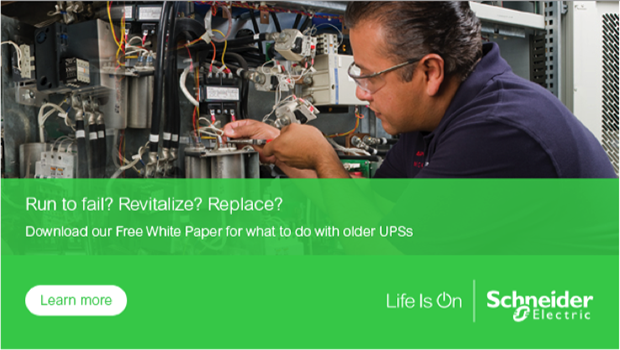 In White Paper 214, Guidance on what to Do with an Older UPS, this point is very well explained. If you compare a modern UPS system with a 96% efficiency rating with an older comparably sized system, the cost of inefficiency can be several hundred thousand dollars. You may be surprised that almost 30% of the loss is from cooling alone! You can read that White Paper here. 4. What about my current service plan? It is quite common that our customers have an existing service plan in place and are concerned that proactively replacing a system will result in unnecessary and exorbitant costs. The good news is that if your contract is with Schneider Electric, we are able to incorporate that existing plan in with our solutions. Even if you do not have a service plan with us, our modernization experts can work with you to ensure your money doesn’t go to waste and find the right solution for you. 5. Isn’t it risky to rely on one vendor for all of our UPS needs? It depends on the vendor! In the case of Schneider Electric, you’re getting an OEM with access to compatible parts and the ability to deliver fast service, both of which can save time and money while limiting downtime. When it comes to one-stop shopping, we deliver everything data center professionals need to keep their facilities running efficiently.